Worthy lottery winners, politics, abortion and the Renewable Heat Incentive scandal are the big stories on Friday's front pages. The Belfast Telegraph breaks from Stormont politics, which had dominated headlines this week, and leads with a story on the RHI cash-for-ash scandal. Headlined "RHI fiasco: the shocking truth", its main story reports that the Northern Ireland Audit Office has uncovered widespread misuse of the green energy scheme. The paper describes the audit office report on the issue as "damning". Auditor General Kieran Donnelly told the Telegraph he had "significant concerns" about the scheme, adding that its lack of controls meant funding for boilers could be "at worst... fraudulent". After the failure to reach agreement on restoring power sharing at Stormont, the Telegraph has relegated politics to the inside pages - and a mere two of them at that. But there is an analysis piece on the options now open to Secretary of State James Brokenshire from Prof Rick Wilford of Queens University Belfast - he says Mr Brokenshire now has "a critical decision to make". The paper's editorial warns: "The public is growing tired of the constant crises at Stormont and the danger is that people will become disillusioned with power-sharing." The front-page picture in the Telegraph strikes a very different tone, however, showing Newry couple Colin and Eithne Bell smiling and drinking champagne after winning £1m in the National Lottery. The paper declares them "worthy winners" and few would disagree due to their charity work, bringing home the remains of people from Ireland who have died over seas. They set up the "Kevin Bell Repatriation Trust" after the death of their son Kevin in New York in 2013. The Bells also make the front page of the Irish News, with Mr Bell telling the paper he and his wife remained "calm" when they realised they had won the money. Colin Bell intends to buy 10-year Premier Level tickets for GAA headquarters, Croke Park, while Eithne will be getting herself a new car and a sun room. Mr Bell said he was happy to win £1m "because we wouldn't want to win £80m" - speak for yourself, Colin! The paper's lead story describes us crashing back down to earth, somewhere in the grounds of Stormont Castle. The paper reports: "Attempts to strike devolution deal many be stalled for months" after the failure of Northern Ireland's political parties to come to an agreement which would re-establish the Stormont executive by thursday's deadline. The Irish News editorial urges the DUP to yield to an Irish language act, the main sticking point between the parties, to allow for the return of the assembly. The News Letter focuses on the abortion issue after an extraordinary day on Thursday for campaigners, both pro-choice and anti-abortion, on the issue. Anti-abortion activists were buoyed earlier in the day by the Court of Appeal declaring the issue was a matter for the Stormont assembly, their satisfaction taken away a short time later by the news the NHS in England will now offer terminations free of charge to women from Northern Ireland. 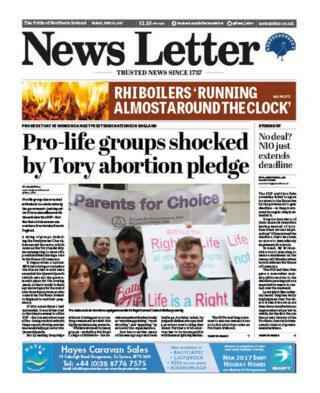 The News Letter leads with the headline: "Pro-life groups shocked by Tory abortion pledge." The paper lays out the Conservative government was forced to make the commitment in order to head off an amendment to the Queens speech which would have made a similar promise but would have therefore forced the anti-abortion DUP to vote for the move - or to abstain. Taking us back to Northern Ireland politics, and the lack of progress at Stormont, the paper's political editor, Sam McBride, warns that a return to direct rule from Westminster involves "major risks" for both the DUP and Sinn Féin. The paper also gives two pages of coverage to language issues with the Irish language and the Ulster-Scots language or dialect, depending on your point of view, both major sources of political disagreement. "Ulster women to get free abortions," is the headline in the Northern Ireland edition of the Daily Mirror. The Mirror's editorial points out that the move will not end the abortion debate and in fact may open a "new chapter" in discussions on the issue. The paper also covers the lottery joy of the Bell family and the deadlock in the Stormont talks.